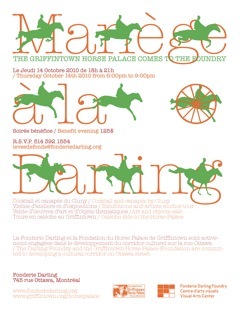 I am pleased to announce that the Griffintown Horse Palace Foundation will be hosting a shared benefit soirée on Thursday, 14 October from 6-9pm with the Darling Foundry. The event will be held at the Darling, which is located at 745, rue Ottawa, in Griffntown. The poster is below. Tickets cost 125$, per person and are tax deductible. They can be procured either by contacting me, or on the Horse Palace Foundation’s website. You are currently reading Griffintown Horse Palace Foundation Soirée at Matthew Barlow.